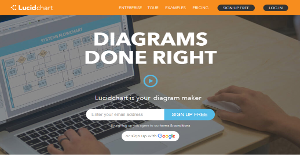 Lucidchart is the ultimate diagramming tool that provides businesses and professional individuals with a web-based, user friendly flowchart platform loaded with multiple features and capabilities to help them with their diagramming needs. Used by more than 6 million users all over the world, Lucidchart allows one to create flow and organization charts, wireframs and UML, among many others. Lucidchart is an ideal diagram tool for brainstorming and managing projects. The tool also works smoothly with popular web applications and business systems, including Google Apps. Lucidchart is so intuitive that it is used in many industries, including engineering, web design and development, and business sectors. Making diagrams to convey ideas, present structure and organization, and create project plans and maps has long been an effective practice for independent professionals to small businesses to large enterprises. With Lucidchart, people have a powerful and reliable diagram and chart making platform that offers smooth user experience and a short learning curve, ensuring that they get the most from the system almost immediately from the get go. What Lucidcharts basically provides you is a platform that enables you to create attractive and professional looking diagrams for almost everything you need for work – business presentations, organization charts for the workplace, even emergency-exit illustrations. And you do not need to be a graphic artist or a professional designer to fully utilize the system. Lucidchart is so friendly that sketching and sharing professional flowchart diagrams is a breeze. This popular, online diagram software is adaptable to your workflows, which means you do not have to modify the way you work to incorporate Lucidchart to your system. Adding to Lucidchart’s vaunted ease of use is its seamless integrations with many of the world widely used and equally popular business systems and applications, such as Google Apps, Google Drive, JIVE, Atlassian, and more. Aside from creating attractive flow charts and diagrams, exporting them in various standard file formats or publishing them to several online document viewer isn’t a problem. Every business has its own characteristics, and can need a special Collaboration Software solution that will be designed for their business size, type of clients and staff and even specific niche they cater to. You should not count on finding a perfect software that is going to be suitable for every company regardless of their background is. It may be a good idea to read a few Lucidchart reviews first and even then you should remember what the solution is intended to do for your business and your workers. Do you need a simple and straightforward solution with only essential functions? Will you actually make use of the advanced functionalities required by experts and big enterprises? Are there any particular features that are especially useful for the industry you work in? If you ask yourself these questions it will be much easier to get a reliable software that will match your budget. How Much Does Lucidchart Cost? We realize that when you make a decision to buy Mind Mapping Software it’s important not only to see how experts evaluate it in their reviews, but also to find out if the real people and companies that buy it are actually satisfied with the product. That’s why we’ve created our behavior-based Customer Satisfaction Algorithm™ that gathers customer reviews, comments and Lucidchart reviews across a wide range of social media sites. The data is then presented in an easy to digest form showing how many people had positive and negative experience with Lucidchart. With that information at hand you should be equipped to make an informed buying decision that you won’t regret. Ideal for collaboarative use with cross-functional teams. A flow mapping tool worth using! An unbelievable piece of software! The greatest for online use. This is a great tool to have and more so if you use a Mac. What are Lucidchart pricing details? What integrations are available for Lucidchart? Pros: Gridlines that are within the lucid chart as well as flows that are pre-defined are great. It's a cinch to drag and drop things. Anything can be sized perfectly. It'll showcase mirrored measurements on items that you'll be charting. So that means no longer having to worry which items are either located closely to each other, smaller, bigger, or are far apart from each other. Cons: I love using Lucidchart. It would've been nice if the free version made room for further flexibility. I've been using the free version for a couple weeks now. I had a hard time continuing without giving into the purchased subscription. Pros: Lucidchart is an awesome tool for doing some things. It's helpful in making wireframes quickly, sharing concepts, and designing critiques. The upside of having Lucidhart is that it lets everyone within the company look into the work you've made. On the other hand, Sketch or Illustrator entails your colleague to buy a license and they lack the ability to share things online. Cons: Similar to that of Illustrator, Lucidchart is a very heavy tool. It's never originally native. It's made to gain accessiblity via the web so it makes things convenient and readily available on any device. Due to heavily relying on the internet, Lucidchart entails your computer to continously process your memory. Powerful and can be accessed easily. An excellent alternative in technical diagrams creation. If you need more information about Lucidchart or you simply have a question let us know what you need and we’ll forward your request directly to the vendor.